"The book is wonderful. It is breathtakingly full of information, and must have taken forever to research. What a wonderful addition to my library. I predict this will not only be on gamers' shelves, but a must for every student of Japanese history and culture as well." "This is a real treasure trove of information, and not just for gamers or authors -- it would be extremely useful as a reference for would be historians as well." "As with any survey of this scope, generalizations are sometimes made and certain topics simplified but make no mistake -- there is a cornucopia of detail in the book. Authors can use the information herein to set up scenarios and backgrounds that are historically and culturally accurate. Gamers, especially those of the RPG and LARP persuasion, will be able to do so as well." "Apart from its value to the gaming community and writers, the ‘han’ section of Daimyo of 1867 along with many of its details on other aspects of Japanese history makes it a useful and handy reference work for amateur scholars. Despite author Ehara’s statement that 'This is not a scholarly piece of work,' there was a lot of research, hard work, and care put into the production of this sourcebook." "The information the book presents is not only engagingly written, but it's also well arranged, meaning that you can easily find your way around the book to locate the details you're seeking. That's a pretty impressive feat, especially in a book intended for use with roleplaying games, which are notorious in their poor organization." "... any book calling itself a "gamers guide" has to include game-related material and Daimyo of 1867 has about 25 pages devoted to generic gaming notes. These include campaign scenario outlines set in different eras of history and discussion of topics of particular interest to gamers, such as ninja, ronin, vengeance, and the like. In each case, Ehara makes clear what history has to say on these topics but doesn't lose sight of the fact that, in a game, it's often acceptable, even necessary, to alter details slightly to make things fun. In doing so, he manages to simultaneously inform and inspire and I found myself frequently imagining ways to use the information he imparted to create adventures and characters for Bushido. I can't imagine others won't be similarly inspired." "I daresay that Daimyo of 1867 is the only book about historical Japan that you'll need to run a great campaign, one that is both reflective of Japanese culture as it actually was but also intelligible to non-scholars. 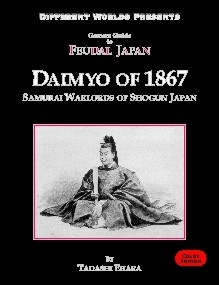 That's as strong a recommendation as I can make when it comes to historical RPG source material and I hope that the virtues of Daimyo of 1867 are widely recognized."